Monday was a great day! I did a lot of manufactured spending and received some free stuff in the process as well. I started out at CVS to reload my Serve card. I walked up to the cashier and asked to do two $500 Serve loads with my card. When I said that, he replied that I can only use cash to load my card, which is not true. So, I explained to him that I have loaded my Serve multiple times with a card. He then walked away, presumably to ask his manager if Serve was loadable via a card. He came back about a minute later and started ringing up the transaction. I am not sure if he was having a bad day or simply thought I was doing something illegal, but he was very off-putting. Since I have this process down to a science, I was pulling out my ID and showing him my card before he needed them. When he saw that he said, “It looks like you have done this a few times” to which I responded, “I have”. He then stared me straight in the eye and said, “If I was a cop, I’d bust you”. I was not sure if he was joking, or thought what I was doing was illegal. Regardless, I chuckled to give him the benefit of the doubt and left. After I left CVS, I headed off to Staples. 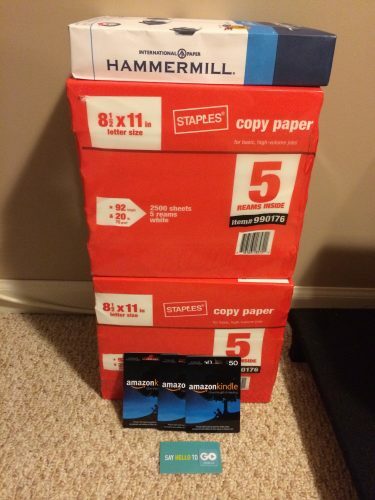 Staples has FAR items very regularly and I decided to buy some of their FAR paper reams after reading Slickdeals’ Stapling thread. I also wanted to max out my Plink rewards, before Staples and Plink broke it off, and get my 1% cash back at Staples via Visa SavingsEdge. So, when I got there I bought 1 – $200 gift card and the reams of paper together so I would get 1% cash back via Visa SavingsEdge and 5X points with my Ink Bold. I then asked the cashier if I could buy 9 – $200 gift cards in separate transactions, to which she said yes. It took about 15 minutes, but in the end I got 3000 Plink Points, 10,537 UR Points, $21.07 cash back, and A LOT of paper for only $71.65. That is why manufactured spending is so great! From Staples I headed to Best Buy. They had a promotion going on where you could trade in certain Xbox One games for a $45 gift card. Fortunately, I had three games I was done playing that I could trade in. I went there and got a $135 gift card to Best Buy for my trade ins, which I used towards $150 worth of Amazon gift cards. Normally this wouldn’t be a money-maker, but the games I traded in were purchased on Black Friday for $40 each. So, I ended up breaking even by trading in three used games for $150 worth of Amazon credit which I value as cash. Unfortunately, yesterday was the last day for the promotion otherwise I would buy some cheap Xbox One games on Amazon and trade them in, as many people did on this thread. As a side note, is anyone getting Titanfall? I have my copy installing as we speak and I am very excited about it! Edit: The servers were down all night which was very disappointing. I stopped at Speedway on my way home, because I had a free coupon for Neuro Sleep. All you need to do is score 300 points on their mini game to win a free bottle! It’s pretty good stuff, especially for free. Then to top is all off, when I got home I had a cell phone screen cleaner waiting for me from GoBank! If you are interested in getting free stuff, check out freestufftimes.com.